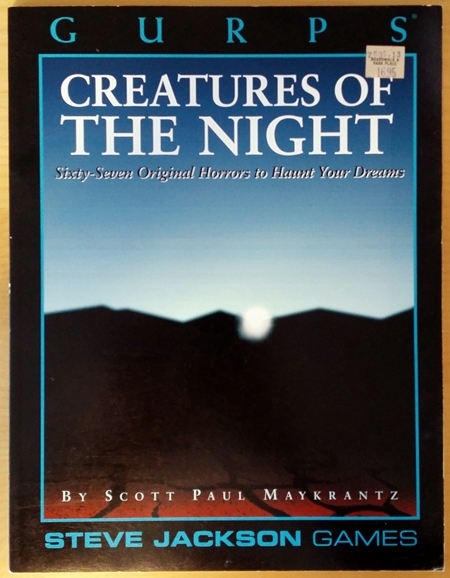 I snagged a copy of GURPS Creatures of the Night, by Scott Paul Maykrantz, because I love monster books and it sounded like this one might be full of weird and wonderful oddballs. Not all of its monsters grab me, but there are some delightfully disturbing creatures in here. My copy was a whopping $4, and I kind of like that the cover features neither creatures nor night. They’re all but stat-free, which is perfect since I don’t play GURPS — for me, this is a sourcebook for other games. Coming off a stint designing Labyrinth Lord creatures, which need a paragraph or two of text at most (plus the stat block), the length of each CotN critter’s entry is a blessing and a curse. When they’re good, it rocks. My favorite CotN creatures are the ones you could build an adventure, sandbox, or campaign around, and knowing how they tick is fantastic. But when they don’t blow my skirt up, the entries feel overlong. In Demon Hunters, the PCs are the marines in Aliens fighting monsters from Call of Cthulhu, more or less. It’s got a darker edge than Ghostbusters or Buffy. Seeking the Source postulates that every monster is related to every other monster, all serving the same master — or masters. That’s a neat hook! The Impostor Wars is basically an Illuminati campaign, but the secret masters are puppeteer-type monsters. This section is only two pages long, but it packs a nice punch — and I love that it provides excuses to use two of my favorite GURPS books, Warehouse 23 and Illuminati (the latter of which would go great with The Impostor Wars). Betweeners are giant creatures that float in orbit, between the Earth’s atmosphere and outer space. They are made of a delicate, crystal-like substance. […] Betweeners absorb genetic information from any creature they can capture. […] Betweeners snare the captured specimen in glass tentacles and slice it to pieces. The genetic information is absorbed by the crystal and stored in the betweener’s consciousness. Once creatures are absorbed, Betweeners send them to Earth as scions, many of whom don’t know they’re working for a betweener. Betweeners accomplish this through a variety of supernatural means, and can themselves be the source of just about any monster-centric or conspiracy-related myth you choose. And if you want to figure out what a betweener is, you may have to go inside it, which feels like a very “2001: A Space Odyssey plus Call of Cthulhu” moment waiting to happen. These are black centipede-like insects that invade corpses, reproducing rapidly as they eat the organs and bones inside. Leaving only the husk of outer flesh, they continue to multiply until they form a tightly packed mass. I love these dudes. I also love the adventure seed “Fingered,” which accompanies them: All Secret Service agents, and many other spooks, are actually corpse-kissers. But why? And to what end? I’d play that campaign. 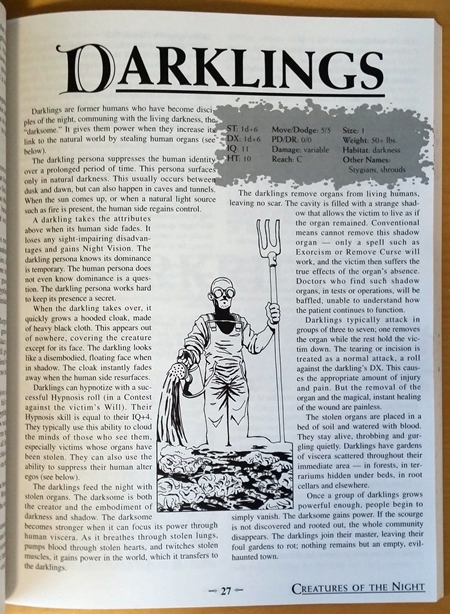 Beings connected to the “darksome” — living darkness — the darklings harvest human organs. Not that weird, right? The darksome becomes stronger when it can focus its power through human viscera. As it breathes through stolen lungs, pumps blood through stolen hearts, and twitches stolen muscles, it gains power in the world, which it transfers to the darklings. Darklings replace their victims’ organs with “shadow” versions, fully functional — and nicely baffling for, say, a PC doctor who encounters a patient with one of these shadow-organs. A lodger is a sentient, insubstantial being that takes control of an inhabited structure to survive — a “haunted house.” The inhabited structure (a house, hotel, castle, RV, etc.) becomes the lodger’s body. I love this explanation for haunted places — and how great it is that you can have a haunted RV? And like the best monsters in CotN, the lodger has another layer: As it consumes the emotions of those inside it (the more intense, the better), you track that in percentile terms. Every time it hits 100%, it gets a new psychic ability and the counter resets. The older the haunted house, the worse the hauntings become. Mooring trees like to strike deals with murderers. What sort of deals? 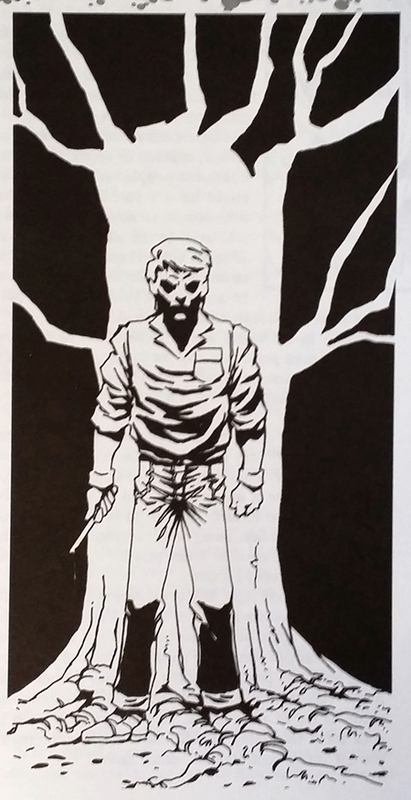 The name comes from their ability to act as a supernatural anchor for anyone who strikes the deal — if the person commits murder, he can be instantly transported back to the tree. That’d make a great hook for a string of “disappearing murderers,” an unsolved chain of serial killings, or a one-off monster of the week session. It’s a versatile concept, and I like it a lot. I can’t recommend GURPS Creatures of the Night without reservation — many of the monsters don’t really grab me, and it’s overlong in places. But some of the creatures in this book are just sublime. The best ones (and there are more than five I’d put in this category) have a strong, unique concept underpinned by just the right amount of depth and complexity, and the length of the write-ups gives them room to breathe. Just writing up the five I like best has filled my head with ideas I’d love to use in a horror game. The Husk of Outer Flesh would make a great band name.